This Ribu, the highest point of the Quarles range, is rarely climbed due to difficulty finding decent, reliable guides, its relatively remote location and the length of time it takes to reach either trailhead and then the summit (where there is a apparently triangulation pole). There are two starting points so a traverse is possible but time-consuming. From Mamuju (west side): The starting point is Desa Paku (approx 700m, a full day from Mamuju by motorbike or car on poor roads) and it takes approximately 3 days to reach the peak (one way) and presumably about 2 to descend the same way. There are 13 Pos on this route but it takes no more than 2 hours from one to the next. Pos 7 and Pos 10 are the only spots for water. Suggested itinerary as follows. Day 1: Mamasa town to Pos 1. Day 2: Pos 1 to Pos 3. Day 3: Pos 3 to Pos 5 and a half. Day 4: Pos 5 and a half to Lembah VE. 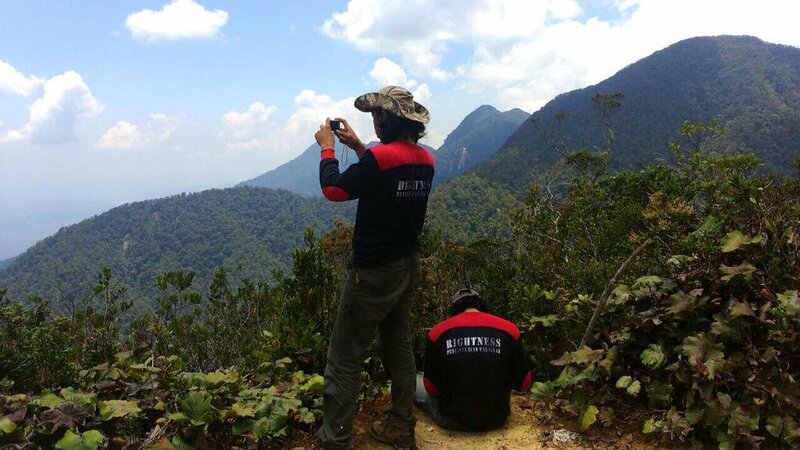 Day 5: Lembah VE to Pos 9. 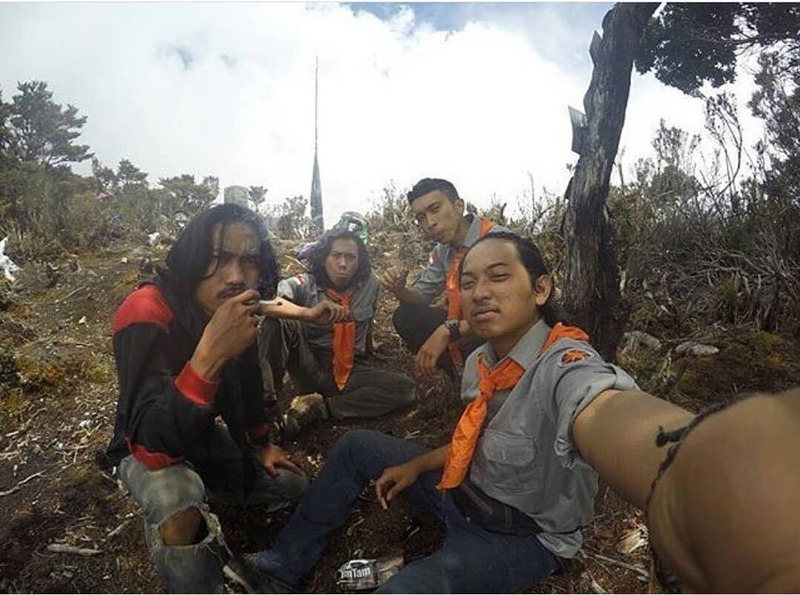 Day 6: Pos 9 to Pos 10 (summit). Estimated times with rough elevation estimates: Kampung Baru (1,150m) to Rante Pongko – 1.5 hours. Rante Pongko to Pos 1 (1,600m) – 3 hours. 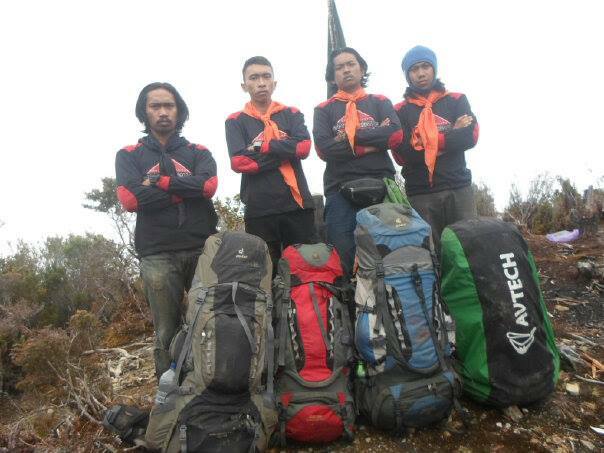 Pos 1 to Pos 2 (2,050m) – 2 hours. 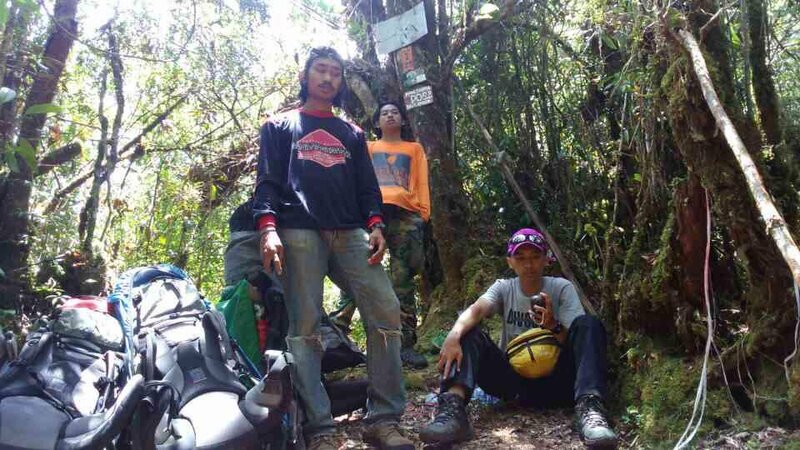 Pos 2 to Pos 3 (2,650m) – 4 hours via Pondok Kecil. Pos 3 to Pos 4 (2,450m) – 2.5 hours. Pos 4 to Pos 5 (2,100m) – 2.5 hours via river. Pos 5 to Pos 6 (2,500m) – 1.5 hours. Pos 6 to Pos 7 (2,100m) – 2 hours. Pos 7 to waterfall – 1 hours. Waterfall to Pos 8 (2,700m) – 1.5 hours. Pos 8 to Pos 9 (2,850m) – 1.5 hours. Pos 9 to Pos 10 – 1 hour. Day 1: Fly to Mamuju to arrive as early as possible (currently there is a flight from Balikpapan arriving around 7am) and arrange transport for very on to Desa Paku. Day 2: Hike via chocolate plantation and irrigation stream and into forest onto the ridge. Continue to Pos 7 (estimated 1,700m elevation). Camp. Day 3: Hike along the ridge, continuing to the summit. Note the peak to the north-east of the summit which is also over 3,000m but probably does not have a trail. Camp at summit. Day 4: Down to Pos 5. Day 5: Down to Pos 3. Day 6: Down to Rante Pongko and on to Mamasa. (Day 7: Transport to Tanah Toraja / Palopo). Expect an update if/when we have done it! Getting there: If doing a west-east traverse, fly to Mamuju from Makassar. Allow a full day to get from Mamasa to Palopo or Tanah Toraja (which is 90 minutes by car or bike from Palopo airport). Accommodation: Simple accommodation should be available in both Mamasa and Mamuju. Permits: Unknown but take passport photocopies to give to village heads. Water sources: Supposedly as follows….. Pos 7 and 10 on the Paku route. On the Rante Pongko route between Pos 3 and 4, Pos 4 and 5, Pos 7 and 8. Sulawesi Barat Sangat Tinggi. permalink. I had been really looking forward to bagging a new 3000m peak over the Christmas period. I had been planning for 3 months with a guide, Ramad from Makassar, who had climbed it on more than one occasion in the past. The plan was an up and down from the Mamuju side, as this was the shortest option, trail-wise, and in December rain would be likely on most days. All proceeded well until about a week before the long0arranged start date when Ramad was slower and seemingly less enthusiastic at responding. Then he said he wouldn’t be able to make it but his friend Pakis in Mamuju would be guiding instead and one of his friends would be the porter for my friend who had already agreed to come and booked tickets. We were due to arrive in Balikpapan on Friday 21st December and then take the 6am Wings Air flight to Mamuju the following morning – the earliest flight into Mamuju at present. 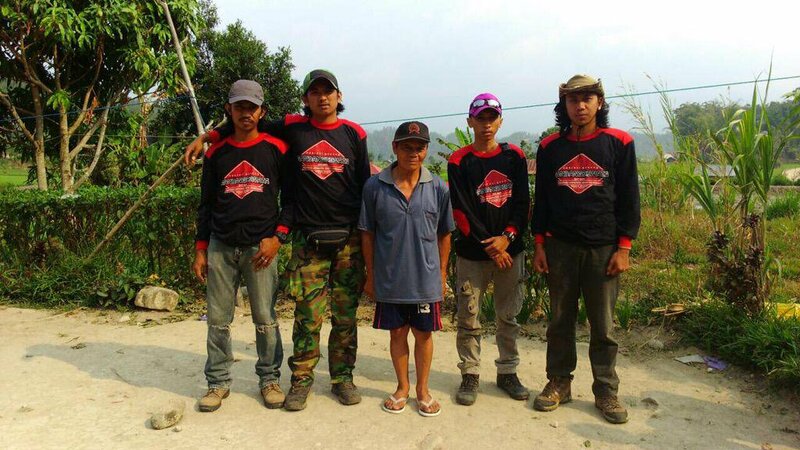 We continued to plan with Pakis, deciding that using motorbikes to Desa Paku might be the best option as he claimed normal cars would not reach the village so we may have to walk in for the last 5 hours! We agreed they should buy food the night before to be ready so that we wouldn’t waste time on the day of arrival. Logistics were ready and prepared. The existence of leeches on the trail was unclear… Ramad had originally said no but Pakis was saying a definite yes. I was very excited about visiting Sulawesi Barat – my final Indonesian province (if you can allow a transit at Manokwari as having visiting Papua Barat) and packed my backpack to perfection on 20th Dec as I would have to take it to work and then straight on to the airport after work for the flight to Balikpapan. Well, in the middle of the night, sometime around 0030, a message was received saying the porter couldn’t come as he was going to be celebrating Christmas (both trailheads are seemingly Christian majority) and Pakis couldn’t find another as the other villagers would be doing the same. Seemed rather strange to decide this at such a late moment – and I didn’t even read this until 5am on the day of departure from Jakarta (when I had to leave my apartment by 6am!) Obviously a non-Christian porter from Mamuju was the most sensible. Very odd. But there was more…. By 4am, Pakis was claiming the weather was bad and that we should reconsider out plans to hike. Yes, the plans I had in place for over 3 months! This is the last thing you want to read the morning of departure when you have a very carefully planned itinerary (which costs a lot of money for flights etc.) It also makes you lose confidence in their competence and honesty, as these issues should have been dealt with before and it sounded like the weather issue was only being mentioned because a porter could not be found. 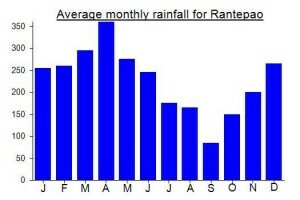 Wet weather in December is normal in Sulawesi – we all know that. After a lot of messaging, they said we could potentially climb it if we took another local with us (who we would have to pay extra for – what a nice little last-minute treat) but we would have to go to the village first and assess the weather. Well, amazingly I don’t like being asked for extra money the day of the hike after 3 months of planning, especially when no guarantee is being given that the hike will even go ahead when we get there. My co-hiker felt the same way and said he definitely wouldn’t do the hike as he didn’t feel confident with them. He would visit Mamuju for a few days though, just as a normal tourist. I was incredibly annoyed with these guys. Ramad in Makassar tried to come up with excuses that it was all to do with our safety rather than their incompetence and inability to plan things well in advance. Really quite offensive when you have booked flights – if it was the other way round and I cancelled on some Indonesians or demanded more money, you can bet they would be outraged. But us non-Indonesians are just supposed to put up with these bad manners. So, be warned, it is tough to find reliable people for this trek. It is tough getting to either trailhead too. Doing it during a Christian holiday is perhaps not the best idea as you won’t be able to find help in the local villages very easily. I decided to cancel this leg of my holiday and go to Pantai Sayang Heulang south of Garut for a night a day or two after I got back to Jakarta. It was the awful night that Krakatau collapsed. I then went to the Derawan islands (amazing atolls including Maratua and the jellyfish lake island of Kakaban) and hoped to rejoin my old itinerary halfway through and hike Ambeso/Ambesu (south Toraja) and then Buntu Puang near Palopo. But almost like a bad joke this too was fraught with issues so I returned to Jakarta and will be going to Karimunjawa for New Year instead as there is now a daily Wings Air flight from Semarang. Not sure I’ll be trying Gandangdewata again for a long time after this let-down. I guess I’ve already done the vast majority of the easy ones. But my friend met a potential guide for the Mamasa route in Mamasa called Novan. His number is 0823 9329 5425. Apparently May-September best and takes 6 days return from Mamasa. He also mentioned Mambulilin as a decent day-hike from Mamasa.